I was recently invited to share a Croatian recipe as part of the World On A Plate challenge, which is being run by the travel company Expedia. I’m always up for a challenge and I love international food (sweeping statement of the day…), so I set about looking for a vegetarian Croatian recipe to share. I went to Croatia years ago (back in 2008, in fact), but since we were taking a cruise along the coast and only stopping in small fishing towns, there was a major focus on seafood, which isn’t much good for a vegetarian. However I knew that Croatia must have plenty of wonderful vegetarian dishes too, and when I stumbled across soparnik, I knew it was perfect! Soparnik is known as a Croatian version of pizza, but really it’s more like a pie, with dough on the top and bottom. It’s traditionally filled with swiss chard, but I used kale instead, since it’s one of my favourite vegetables at the moment (I sure do love a good food trend…). 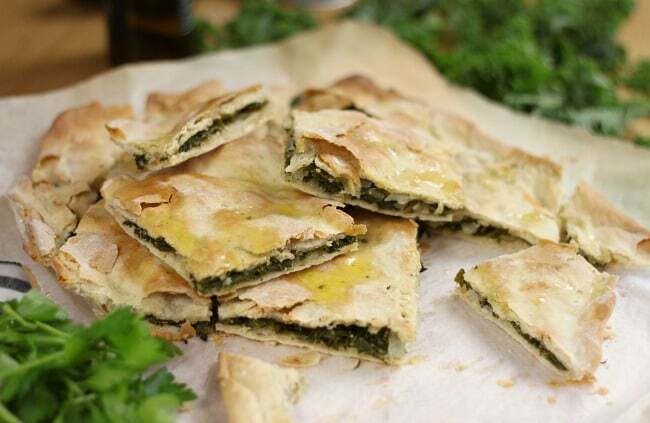 So if ‘soparnik’ sounds too exotic for you, just think of this as kale pie, and you’ll feel right at home. The soparnik was really easy to make. For the dough, I used the same recipe as I used for my cheese and onion stuffed flatbreads, which I shared back in September. I raved about how easy the dough was at the time, and it proved itself once again – no holes poked by fingers, no sticking to the worktop, no nothing, just a really user-friendly dough! 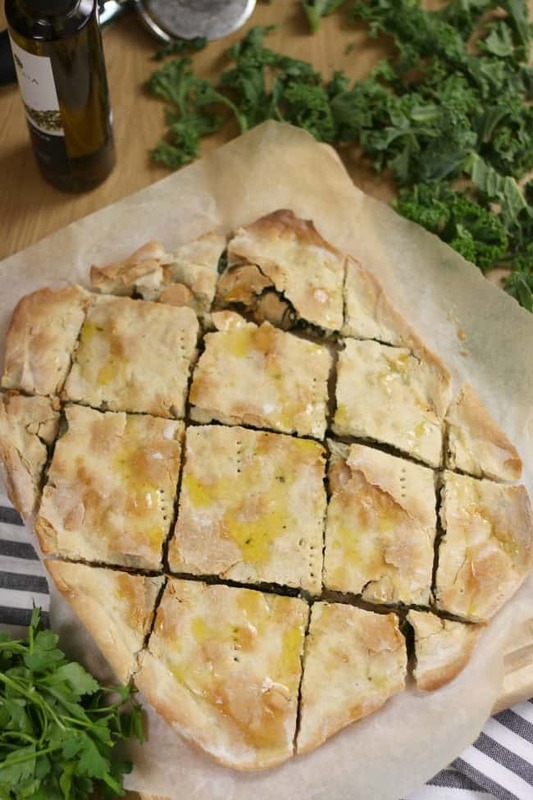 Fill it with a mixture of kale, onions, garlic and fresh parsley, and you get a wonderfully comforting, yet relatively healthy and relatively authentic Croatian kale pie! i.e. a bit of a mess. …but, chop it up into the traditional diamond shape, and it suddenly goes from ‘strange slab of dough’ to ‘beautifully rustic pie’. I drizzled mine with a little extra virgin olive oil to add an extra bit of Mediterranean flair. I’ll definitely be keeping an eye out for soparnik if I’m ever in Croatia again, and I’d also 100% recommend visiting the country! Absolutely stunning coastline, interesting cities, and spectacular scenery (and lovely kale pie!). Add the plain flour, olive oil and salt and pepper to a large mixing bowl. Gradually adding the water, knead the mixture with clean hands until it comes together into a dough. The dough should be moist but not overly sticky, so you may not need all of the water (or you may need a dash more!). Continue to knead for a few more minutes, until the dough is fairly elastic. Place the ball of dough into a lightly oiled bowl, and cover with a tea towel. Leave to rest for 1 hour. While the dough is resting, prepare the filling. Remove any tough stems from the kale, and chop the leaves. Add the finely diced onion, garlic and parsley, along with a tbsp of olive oil and a touch more salt and pepper. Mix well, and set aside. When the dough has rested, transfer it to a lightly floured surface. Divide the mixture in two, and roll the first section out to your desired size (the thinner the better). My baking tray measured around 12 x 9 inches, so I kept this in mind when rolling. 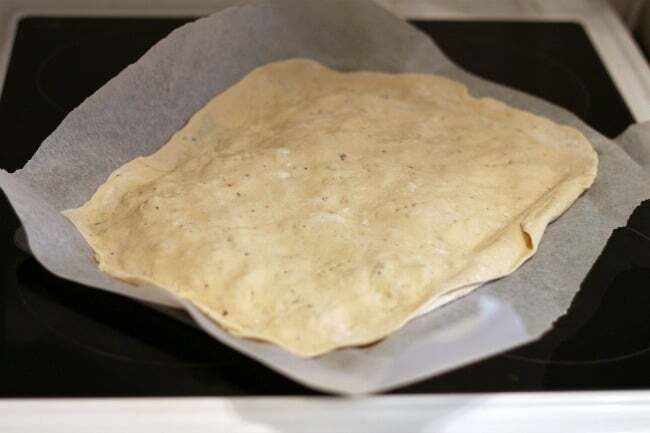 Transfer the rolled-out dough to a sheet of baking paper, and add the kale filling, making sure it's spread out evenly to the edges of the dough. Roll out the second piece of dough in the same way, and place it over the kale filling. Using a rolling pin, press the two layers of dough together over the filling, pressing out as much air as possible and tightly sealing the edges. Make a few small holes in the top of the pie with a fork. Bake at 190°C (Gas Mark 5 / 375°F) for around 20 minutes, until lightly browned. 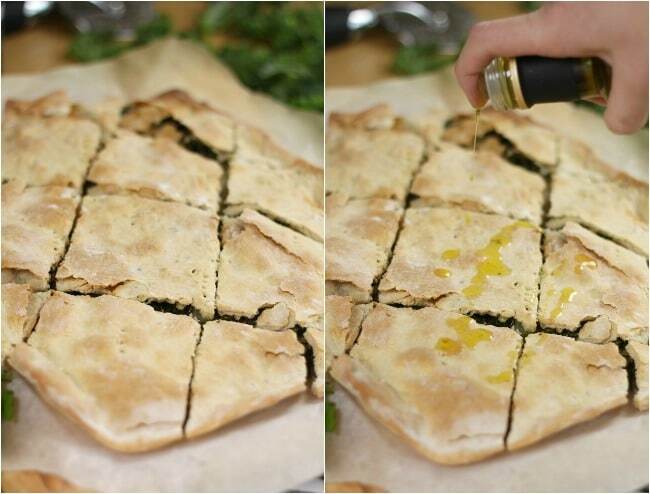 Cut into diamonds with a pizza cutter, and serve warm, drizzled with extra virgin olive oil if desired. Hi! I’ve red your recepie for soparnik and I must say that it is great that you try to invent something that reminds you about Croatia and our Soparnik.But this is not soparnik. 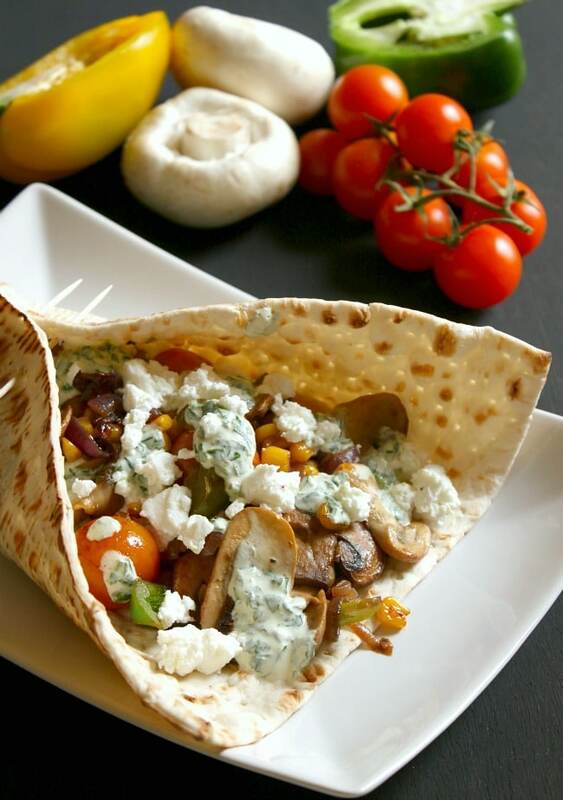 Please com back to Croatia and try our real homemade Soparnik. Amazing recepie! 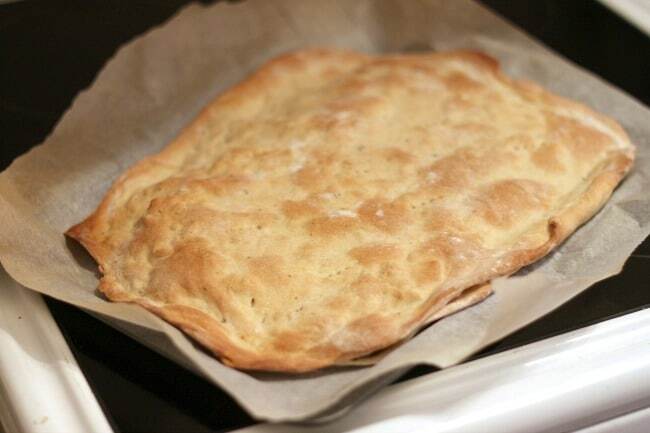 Soparnik was actually prototype of pizza that Romans brought to Italy. It’s traditionally baked in heated ‘komin’ covered directly with embers. It tastes devine when traditionally made. After cooling its spread with olive oil and garlic. Also Croatian homemade olive oil is to die for. I made this for a Workd Cup final viewing party this morning- we were rooting for Croatia. Since it was breakfast time I added some sliced hard boiled eggs on top of the kele mixture before baking for a bit of protein. It was a hir! the recipe is great only soparnik is made with mangold, not kale. I might try it with kale too! Interesting! I’ve never heard of mangold! It is also called Swiss chard. I am certain you have heard of it. Google it, that might help! I tried this recipe tonight. The m ix of ingredients filled my home with a delicious aroma. Thank you! I can’t help but wonder if the addition of cheese to the recipe would enhance the mixture of flavors. Any recommendations? Cheese would be great! I use too much cheese in general so I try not to add it to everything ;) but I’m sure a bit of crumbled feta would be great in this! Looks great. I’m going to try this tonight, but with a spinach and kale mix. And I’m going to put some feta cheese in also. Thanks for the recipe! I love spanakopita so I know I would love this too. The idea of making a proper pie would make it perfect picnic food but also great for cold winter day lunches. It could last a few days I imagine and anything with pastry always gets my vote! I love the way you say it doesn’t look special but I’ll bet it smells amazing and looks like it would taste brilliant when you cut it open and drizzled it with olive oil! Just like in the Disney movie “Ratatouille” where the food critic, Iago, takes one bite of Remmy’s dish and is immediately whisked back to when he was a little child and was comforted by his mother’s version the same dish . . . . well, that is the experience I had. Bravo Rebecca! You are a very gifted chef! Looks great Becca. I think I’d really enjoy this. Nice recipe. Well this looks rather heavenly! I’m a big fan of kale (well, a recent convert thanks to my lovely veg box providers) and so I am definitely bookmarking this for future baking! This sounds delicious! But the recipe doesn’t tell us how much kale is required. Any clues please? 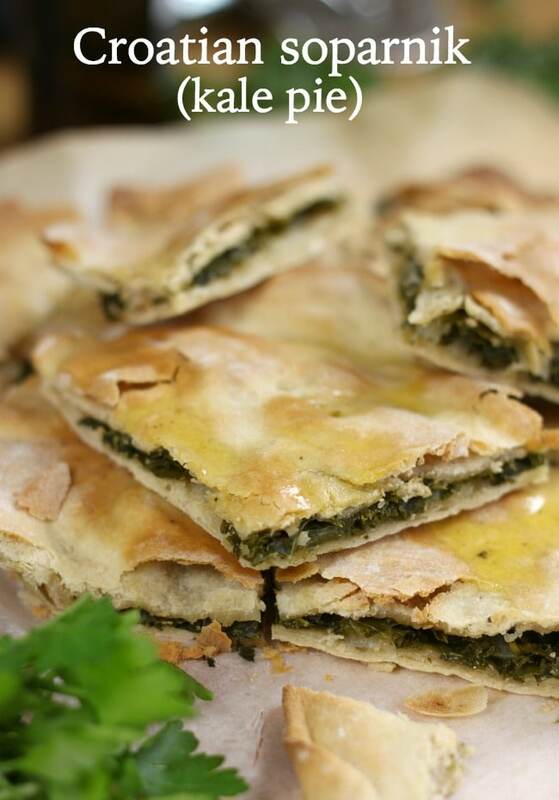 Interesting how recipes morph across borders – I thought it looked like Spanokopita too. I’ve got kale and chard from the farmers’ market this week so maybe a Croatian pie is in order. This sounds delicious! There are not enough main dishes that revolve around kale. But this combination of greens and pastry sounds perfect. YAY. 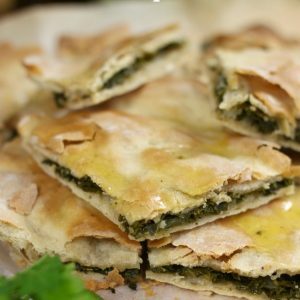 Reminds me of Spanokopita, and this sounds amazing! (Bookmarked!) Croatia is on my list of places I want to go. It’s a similar idea! Dough instead of pastry though :) Croatia is absolutely stunning, you should definitely go! !